In the days before the Piccadilly Line reached Heathrow Airport how would a person of means in Central London get to the airport if they didn’t want to use the roads? Why, they could fly of course – and from just outside Waterloo train station no less. What was officially known as the British European Airways (BEA) Waterloo Air Terminal was opened on the Festival of Britain site on July 25, 1955 by the then Minister of Aviation and ran a helicopter shuttle service between London Airport and train station. The passenger building itself reused part of the Waterloo entrance to the 1951 Festival of Britain as seen below in this photo from the RIBA archive. Two helicopters were used, named Sir Kay and Sir Ector and were the UK variants of the Westland-Sikorsky S55, and could carry five passengers each. The service carried 3,822 passengers before it closed down. However, it fast turned out that the majority of passengers were using the service as a cheap sightseeing tour over the centre of London, so it closed 10 months after it opened. There is a fantastic Pathe News film of the helicopters approaching London and landing at the South Bank – which is available here – watch the whole thing, or jump to 2:50 if you want just the helicopters. Another reason for the closure – the site was needed for the South Bank centre development – but there was talk for a while of putting helicopter landing pads on the roof of Waterloo Station itself, but there were concerns about the Shell Building being in the way. Ten years later though, they were back with plans for a river-based helicopter landing pad to be based near Waterloo running 26-seater helicopters between Waterloo and Heathrow. Quite obviously, that never took off – but some decades later, BEA’s successor was back at the South Bank when British Airways agreed to sponsor the London Eye. Which is quite a nice circle to complete. The inspiration for this blog post was a museum I visited today that had a photo that caught my attention. More about that next week. Second photograph – is that the clocktower encased in scaffolding? The helipad by the river at Battersea opened in 1959, apparently. I wonder if it was inspired by this one. And there was a helipad on a barge in the City until 1985. Yes – you can see a closer view in the Pathe News clip I linked to above. Battersea was built as a temp heliport lasting for 5 years even though it’s still there and busier than ever. I can’t say I ever noticed the other heliport on the Thames but I believe it was at Blackfriers but its the first time I’ve heard it was on a barge. Must have been fun landing on that with a big tug going past. Shame they lost sight of the need for great architecture befitting such an important airport from the 60s til date… T5 is fine if you like that style, which I do, but the entire rest of LHR is just awful and doesn’t give our international visitors a great first impression! 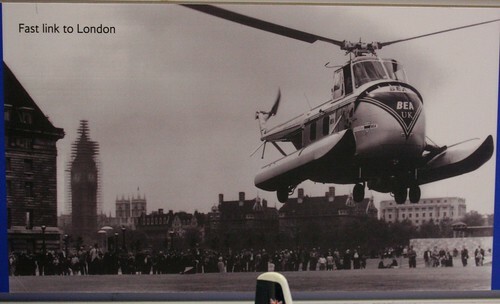 Never knew you can actually get a helicopter from Waterloo station to Heathrow Airport back in those days. Amazing. 1 Pings/Trackbacks for "The year that you could catch a Helicopter from Waterloo Station"